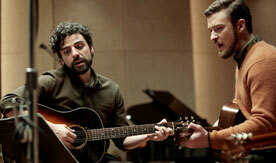 …Or, A Week in the Winter of Llewyn Davis’ Discontent; but the titular folk singer in the Coen Brothers’ latest is probably saving that longwinded, dire designation for a follow-up album – if it ever happens, that is. Though unconventional, Inside Llewyn Davis is forthright with its narrative and more quietly quirky than comedies in the Coen cannon that gleefully celebrate the peculiar. The oddball charms are still there, just a bit more grown up and emotionally resonant. Kinda like a good folk song. Inside Llewyn Davis is a deep, meaningful film unburdened by a heavy plot. Llewyn (Oscar Isaac) is a musician in 1961 New York, getting whatever paying gig he can. He’s obviously not getting many as he is homeless and drifting from couch to couch of friends, family, and new acquaintances. One of the crash pads is that of former lover Jean (Carey Mulligan), who is now partners in life and in music with Jim (Justin Timberlake). Llewyn’s relationships with the various boarders are strained for good reason and his aging, inattentive manager has no royalties to hand out. After getting some quick cash from a studio recording session – an effortlessly hilarious trio that features Jim and the booming bass voice of Al Cody (Adam Driver) performing a song titled “Please Mr. Kennedy” – Llewyn takes a road trip to Chicago for an audition. Joined on the drive by gravelly-voiced , bullish musician Roland Turner (John Goodman) and his nearly mute, chain smoking liege Johnny (Garrett Hedlund), the voyage is a sad and desperate attempt to salvage a lost career before succumbing to a life in the Merchant Marines. It’s a remarkable feat that the expert storytelling of the Coens and an extraordinary lead performance from Isaac make spending so much time with this weepy, disagreeable character so engrossing. Llewyn is the type of performer who shuns the notion of being “careerist” and believes he exists on a more elevated artistic plane. It’s not his fault if no one else gets it; the brutal irony being that his life is in such disarray he can’t compose himself enough to connect with an audience. Despite his faults, we root for the guy because he is in fact very talented and he has endured hardships he doesn’t know how to deal with. Instead of funneling that suffering into an expressive career, he has mastered the skills of avoidance and irresponsibility with any dedication to himself and others replaced by an all-consuming general malaise. A series of cute, bright orange tabby cats are a physical manifestation of that shirking of accountability. The furry felines are an interesting and welcome device that is wholly Coen-esque – beautifully bizarre but not so off-the-wall it doesn’t connect. Llewyn inadvertently lets out the cat of his well-off friends and is forced to care for it as well as he can – which is to say he eventually loses it. A second cat Llewyn leaves to its own devices, and on the dark, snowy drive back from Chicago, another is abandoned after it is injured. He can’t shake this cuddly portent, and as the consequences of his recklessness escalate, Llewyn is forced to confront his character. We understand what it means when he drives past a freeway exit with a significance that I won’t spoil, and maybe he’s finally getting it, too. Cats aside, it’s also important to listen closely to the actual words said by the human characters, and more so how they are spoken. We laugh at Llewyn’s sarcastic deadpan barbs before realizing that he’s acting out his inner funk. We certainly understand Jean’s frustration with him and appreciate the extra-emphasis on her colorful adjectives. In a brief appearance as an exec Llewyn auditions for, F. Murray Abraham says the name of a record a certain way before the audition and slightly changes his tone after. It’s a great, great touch. Mixing their singular sensibilities with a story that is all about a lost artist, the Coens spin a yarn that is amusing, moving, and subversive – the humor and the distress coming about honestly. There’s some genuinely great music sprinkled in as well that is both fresh and comfortingly familiar – as Llewyn says, “it may have never been new, but it never gets old.” Neither does the tale of this wayward soul caught in a cycle of melancholy with no hopes of breaking through due to his lack of purpose. Especially sad considering that even the lost cat had a clear goal and worked to accomplish it.